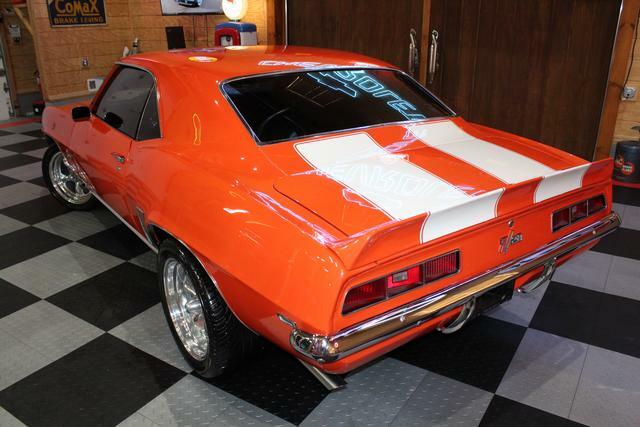 No Reserve Classics is proud to present this very highly optioned modernized 1969 Camaro for sale! If you’re the kind of guy or gal wants to enjoy driving a classic car that can keep up with other modern cars on the road, then say no more! 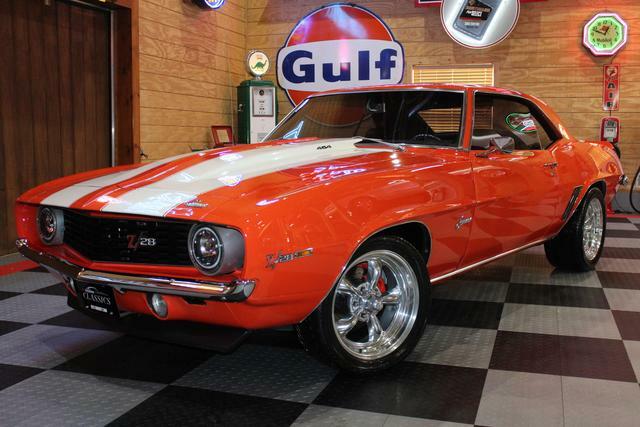 This particular Camaro is powered by a GM Performance Parts 454 Big Block Chevy crate engine that overall is a super comfortable, fun, reliable, yet powerful car to drive. 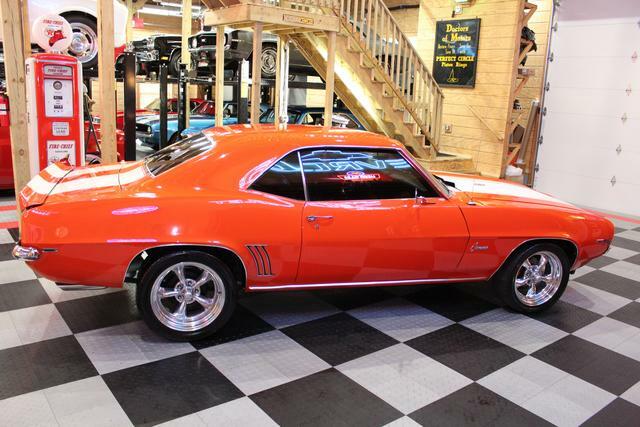 It’s mated to one strong and lightweight Tremec TKO-600 5-Speed Manual Transmission sends the Big Block power to the ground with its heavy duty 12 Bolt Limited Slip Rear End. 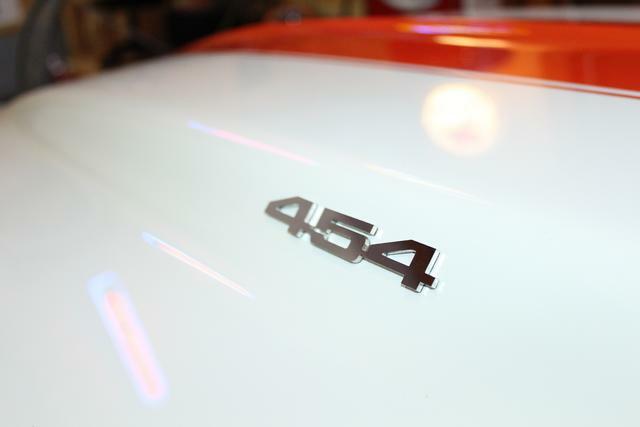 The engine fires up with ease, runs strong with incredible Oil Pressure, and has lots of street-friendly torque and horsepower that can chirp the rear tires through 3rd Gear yet cruises like a modern car on the highway with its Overdrive 5th Gear! Need to stop quick? No worries! It was also upgraded with Power Front Disc Brakes that are equipped with high performance drilled and slotted rotors that stop on a dime. Running late to church on that early Sunday morning? Remain calm…this car has super tight and responsive steering that can corner hard and get you where you need to be on time and in style. 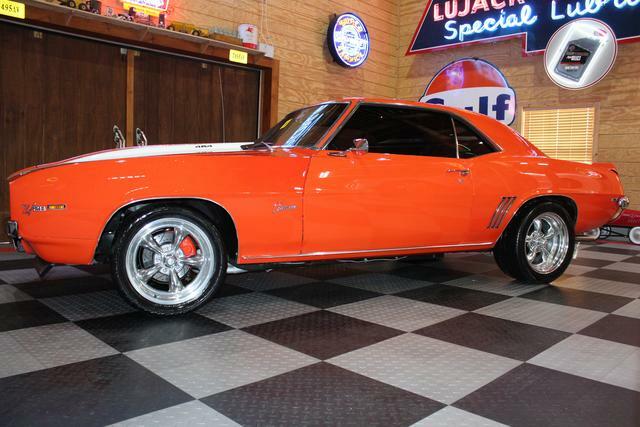 Its Hugger Orange basecoat-clearcoat paint shines like glass especially after its complete exterior detail. 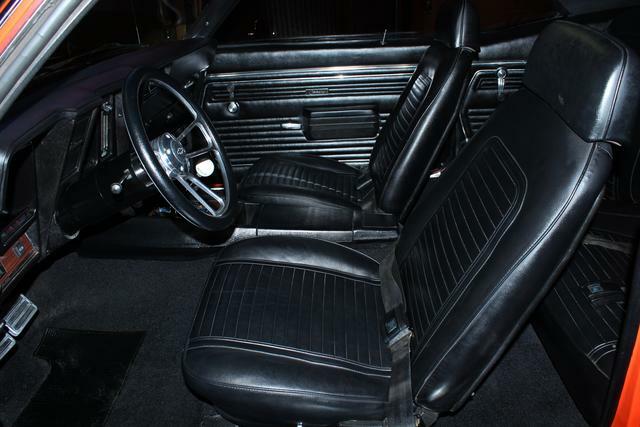 Inside you will comfortably drive in a Black Bucket Seat style interior with center console that features an ICE COLD Vintage Air Conditioning System. Little chilly outside? Switch it over to heat and feel the warmth! 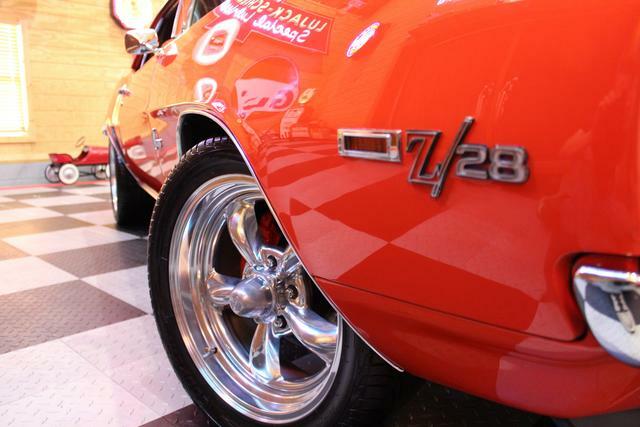 Decked out with Z/28 Trim around the car, we are sure this car can please anyone and turns heads anywhere you go. Don’t stop here! 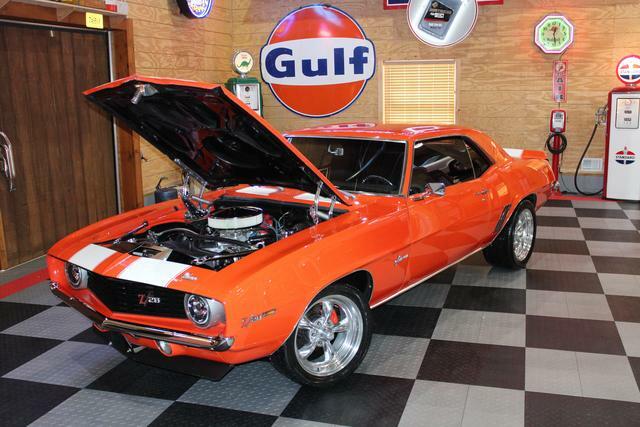 Keep reading all of the details below to see why this Camaro separates itself from the rest on the market! 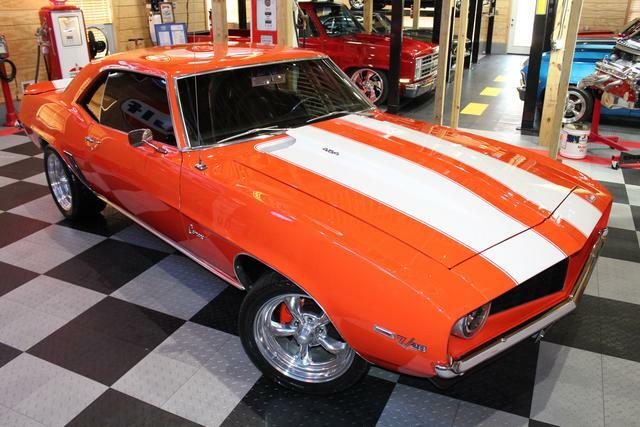 Overall this car is the perfect candidate for someone who wants the best of both worlds—appearance of a classic car with modern drivability—between the Tremec 5-Speed Transmission and the Vintage Air Conditioning and Heating System. 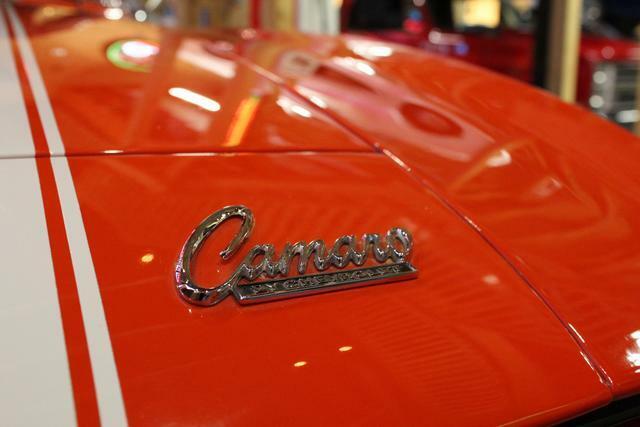 There is a lot to love about this car and is great for any classic car enthusiast who wants to buy something they can actually drive. With that being said, this car is not a full nut/bolt or frame off restoration. 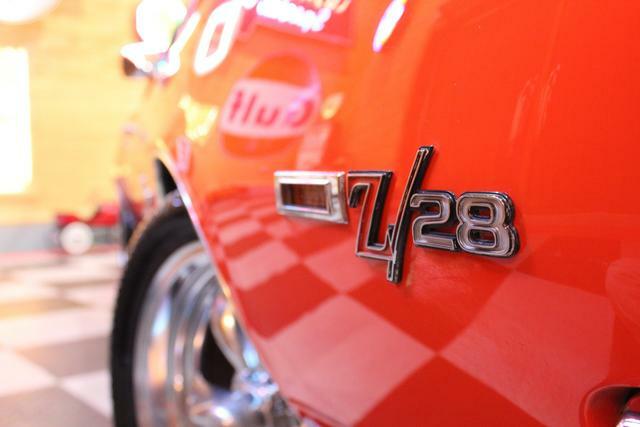 Despite all of the great, awesome things this car has, it is still a 50 year old classic car with imperfections such as rock chips, scratches, and minor bubbling. However, we would still be proud to drive this car as much as possible and take it to local car shows with family and friends. 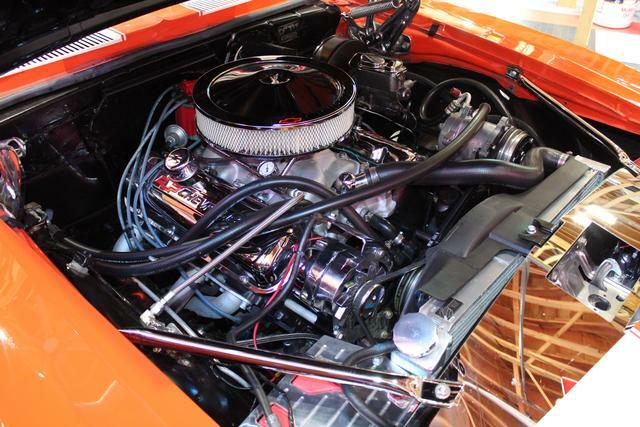 Fully show ready engine compartment that was just extensively cleaned and detailed! Dressed up with so many chrome and polished accessories that the moment you open the hood at a car show, you'll give everyone around you a reason to drop their sunglasses on. 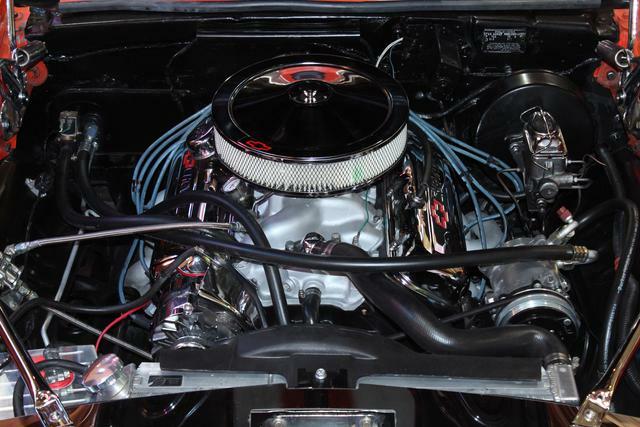 Powered by a GM Performance Parts 454 Long Block Crate Engine with little mileage, you will have old school thumping Big Block Power yet modern reliability with today's performance engineering. You will get MANY years of use out of this drivetrain as it has been completely overhauled from front to rear. 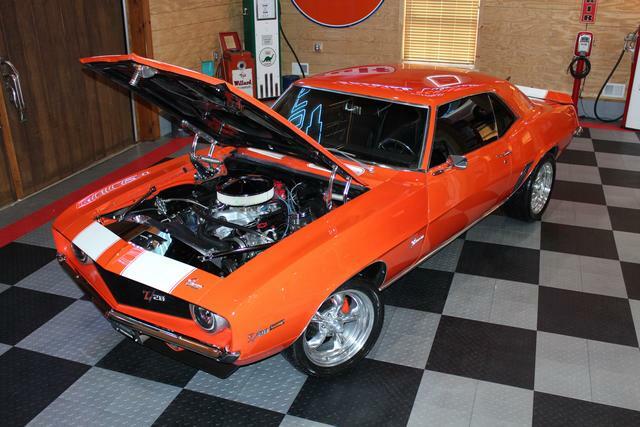 Mated to a Tremec 5-Speed Transmission, you can either bang through gears around town and chirp the tires into third gear or cruise quietly on the highway with its super high (numerically low) Overdrive 5th Gear Ratio! 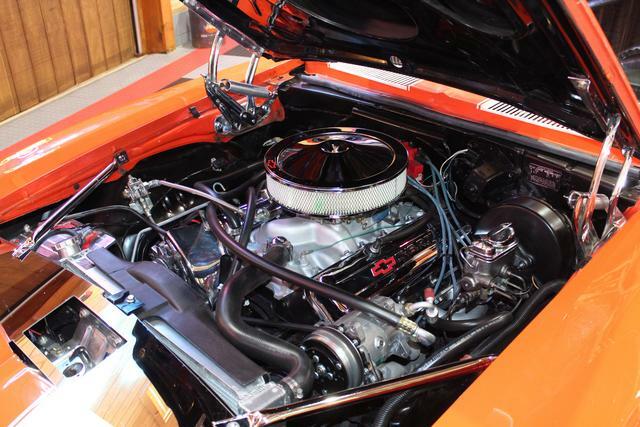 Holley 4150 (4779-9) 750cfm Double Pump Carburetor with Choke that feeds this Big Block the right amount of air and fuel to start her up and get moving without hesitation! Power Front Disc Brakes with Upgraded Drilled and Slotted Rotors that stop this car on a dime! Effortless Power Steering that is super responsive and tight. No need to constantly correct your steering from a lousy and tired suspension. This car steers around corners much better than anything that would've come from the factory in 1969. All New Rubber Hoses Incl. 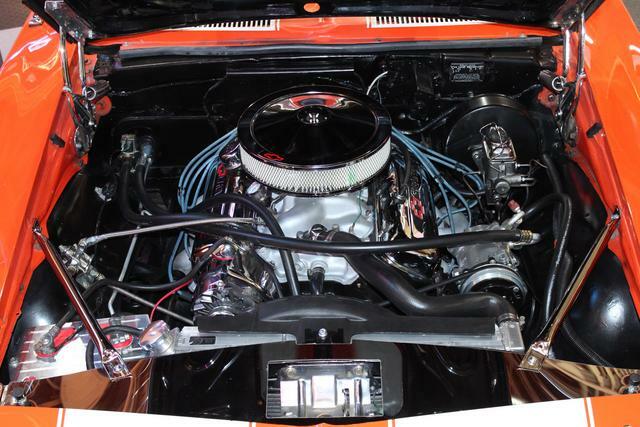 Upper/Lower Radiator Hoses, Heater Core Hoses, A/C Lines & Hoses and so much more! Be Cool High Performance Multi-Core Aluminum Radiator that is rated to cool engines producing massive amounts of torque and horsepower and will keep this engine running at the right operating temperature. Vintage Air Conditioning and Heating System that features ALL Brand New Components! Completely Electronically Controlled System that utilizes modern relays to simplify its operation for many years of usage and ease of maintenance! Capable of cranking an engine with a much higher compression ratio than this engine produces! 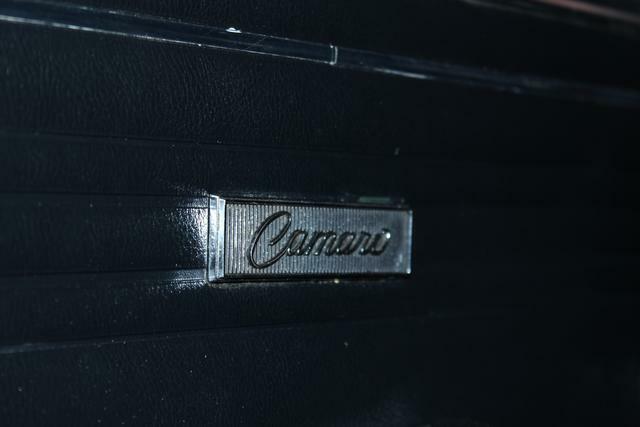 Makes starting this Camaro super painless even during the cold winter months! 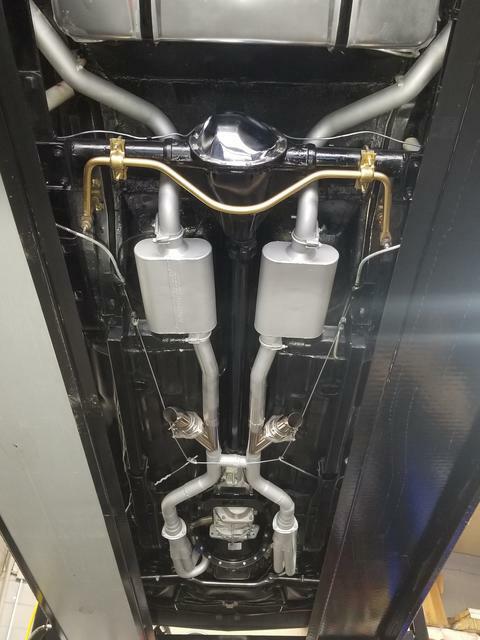 High Performance Full-Length Exhaust Headers that lead into a Custom Mandrel-Bent 2.5" Flowmaster Dual Exhaust System with an H-Pipe Crossover that scavenges exhaust a lot better than anything factory. This keeps the engine running cooler and will restore the lost torque and horsepower that any factory exhaust takes away. Not to mention you will also get better reliability! 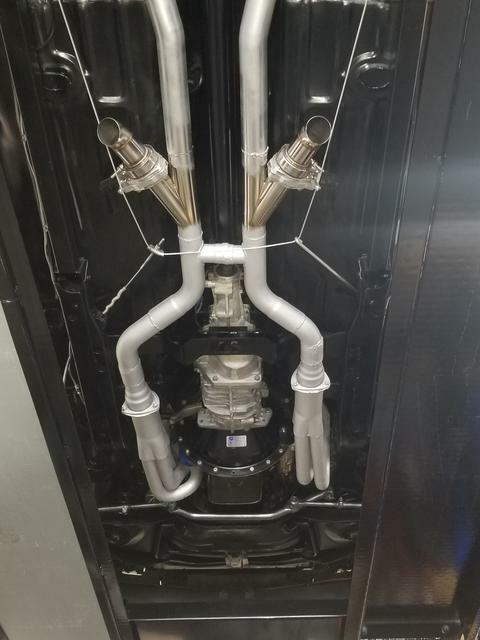 Brand New Custom Electric Exhaust Cutouts that lets the other person at the red light know your Camaro has an earth-shattering Big Block that is NOT to mess with! Open them up with a simple flick of a switch conveniently located on the dash! Custom Black Painted Underside of the Hood! This is typically left in a simple black electro-deposit primer coating (aka EDP Coating) which is only used to protect the panel from corrosion during shipping and storage. This is NOT a permanent coating made to protect the panel from weathering and corrosion after its installation. The body shop knew this and properly sealed the underside of this hood! High Performance Lightweight Flex-Fan that reduces drag on the engine yet still keeps airflow moving at a high rate! Freshly detailed exterior that makes this car shine like new. All paint work was detailed with a full buff, compound, polish, and wax! 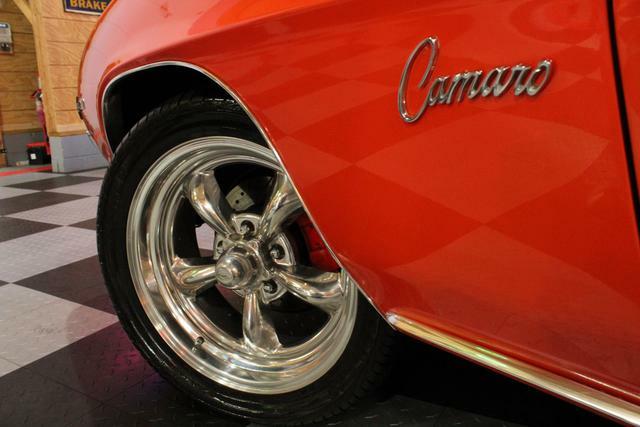 The chrome and trim underwent hand polishing to bring out the beautiful luster that classic cars are known for. 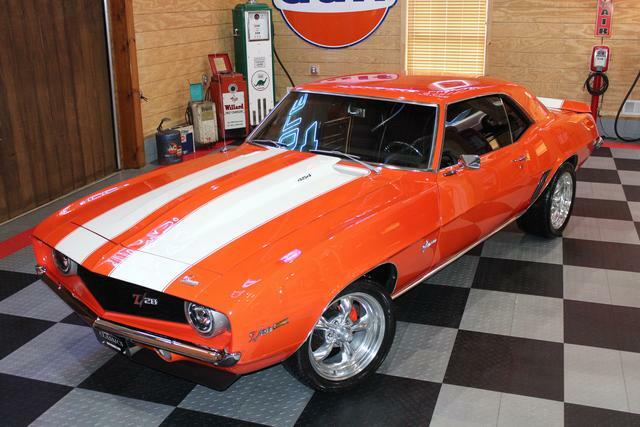 Painted Basecoat-Clearcoat Hugger Orange that this 1969 Camaro pulls off just right with its painted white Z-Stripes (beneath the clear)! 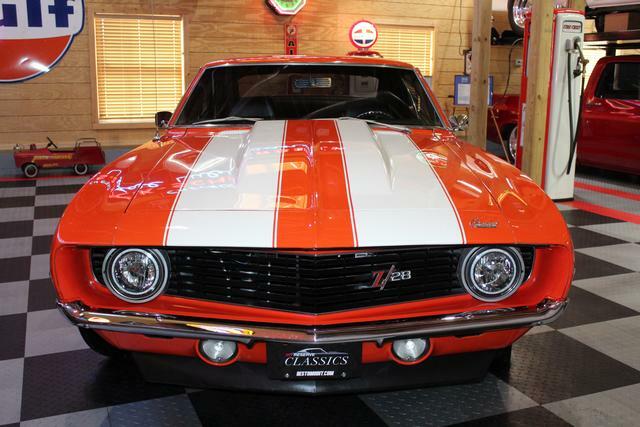 These stripes set a perfect contrast to the car between the beautiful polished wheels! 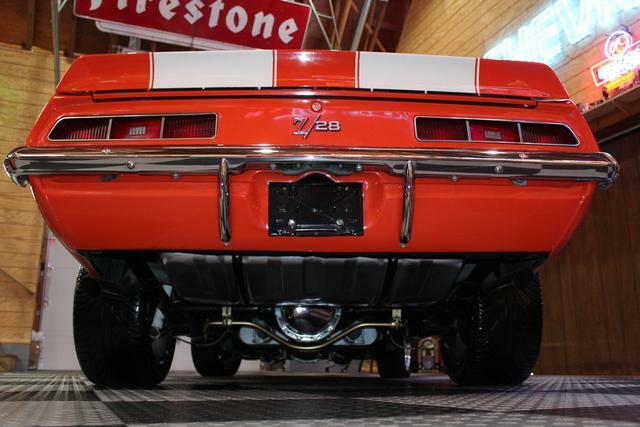 17" Eagle Alloys 2-Piece Forged Polished Aluminum Torq-Thrust style Wheels that sit on this car at a perfect stance! 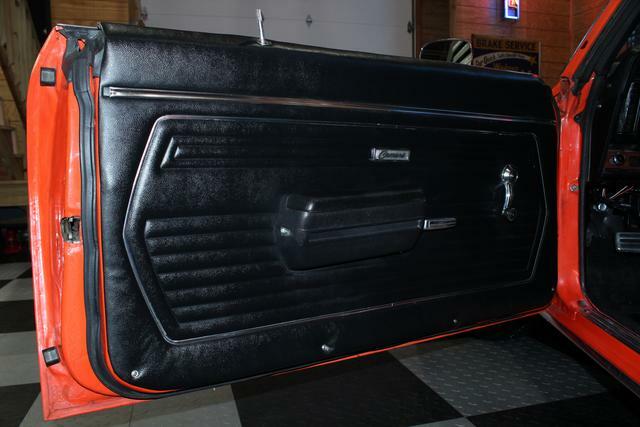 The beautiful luster is the perfect combination for the Hugger Orange/White Stripe paint combination. 2-Piece Forged Wheels offer a lot more strength than a conventional 1-Piece 'As Cast' wheel. They are less prone to damage/warpage from potholes and other imperfections in the road. Not to mention they will retain their shine a lot longer than an 'As Cast' wheel due to the higher grade Aluminum-Alloy that is used during manufacturing that is less prone to oxidation. Drilled and Slotted Rotors and Custom Painted Calipers are easily seen through the open area in the wheel which give this car that ultimate modern look as well as high performance braking capabilities! Freshly Painted Front Grille to match the rest of the car! These grilles are usually left in black bare plastic which eventually fades away and sits unprotected from the Sun's UV Rays resulting in brittle areas that crack easily. Not to worry this grille was just painted with basecoat-clearcoat Hugger Orange to protect it and help flow the color on the rest of the car nicely together. 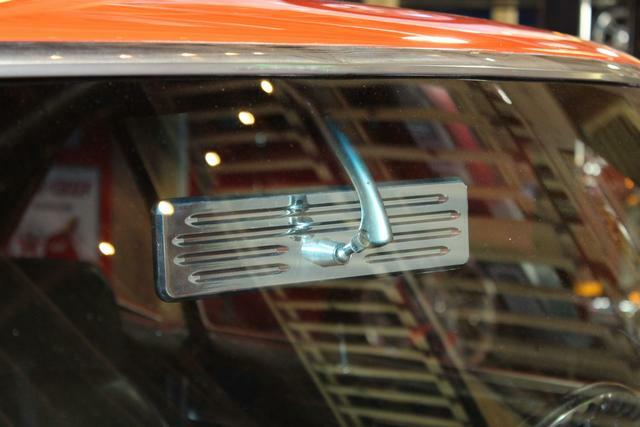 Brand New Morris Classic Concepts Custom CNC Cut Polished Mirror-Like Stainless Steel 454 Hood Emblems! Brand New Custom RestomodIt Brand Halo Headlights with a Full LED Headlight Kit for modern nighttime visibility! This is something these cars flawed right from the factory. 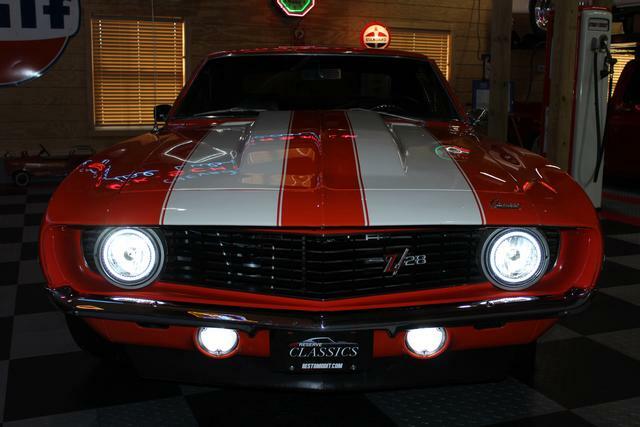 They utilized high intensity halogen bulbs that were powered solely by the headlight switch. In turn, they tended to draw a lot more current, burn hotter, and provide very little visibility especially at lower speeds. LED's (Light Emitting Diode) are a modern form of technology being used across the entire lighting industry. From automotive to household to commercial purposes, they offer more than 40% more brightness as well as a super reliable and long lasting life compared to conventional halogen bulbs. No longer does this Camaro suffer from its factory-flaw. They draw less current and require less power to function making your headlights glow great again! Not only did we do an LED Headlight Conversion...we also took it a step further and installed custom LED Switchbacks where the parking lights normally sit. This combines the function of a fog light as well as a turn signal into ONE! As the turn signals are off, you have a bright white LED in each housing giving you low ground visibility. 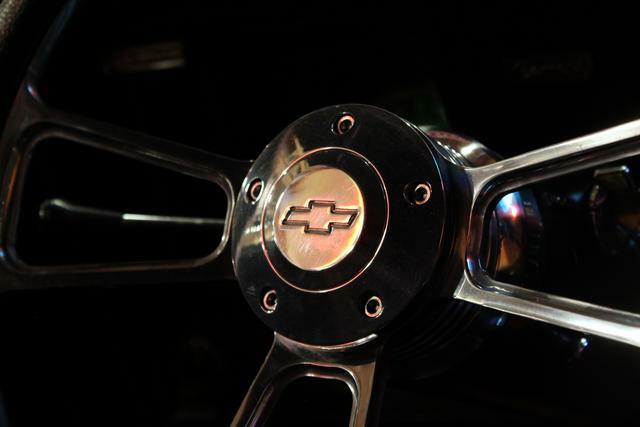 When a turn signal is activated, the LED switches to a pulsating Amber (like a regular turn signal bulb!) color light until the turn signal is turned off. From there, a 1 second delay goes by before the white LED returns! 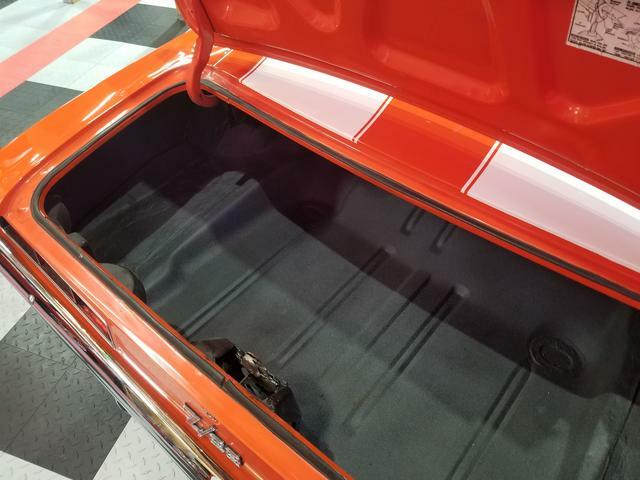 This is a new technology that we've been utilizing in just about all of our Camaro's to give them that modern functionality that we would want in our own car if we were daily driving it. 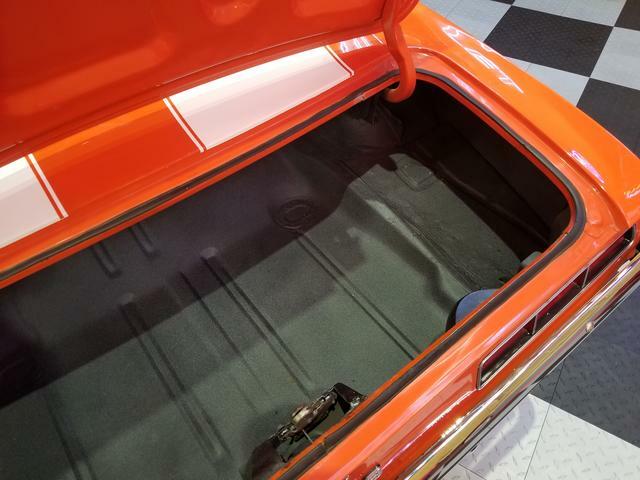 All the correct trim around the car is present making this car very complete and car show/event ready. Headlights (High and Low Beam) - Fully Working! Turn Signals on all four corners - Fully Working! Reverse Lights - Fully Working! Sidemarker Lights - Fully Working! Brake Lights - Fully Working! Front and Rear Parking Lights - Fully Working! Hazard Lights - Fully Working! 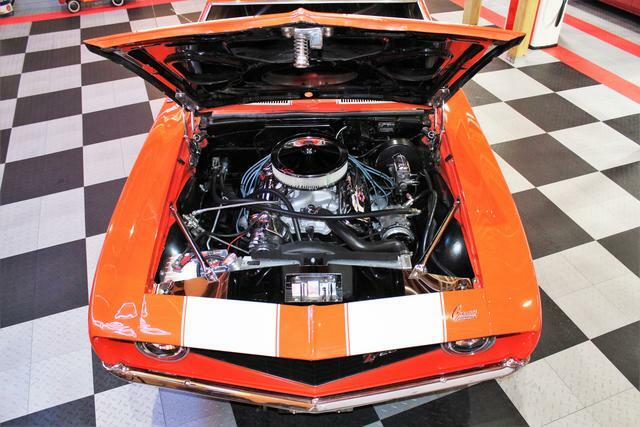 How many 1969 Camaro's can you find with as many working components as this particular one? Not many at all!!! Fully Tinted Side Windows Front and Rear as well as the Rear Window! Keeps the sun out of the interior on those hot summer days! Between the Vintage A/C system and these tinted windows, you're going to feel like you're sitting in a luxury limousine! All side windows roll up and down with ease!!! 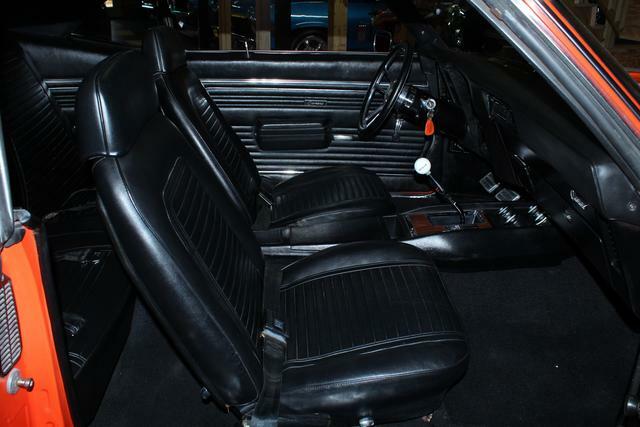 Many highly desirable features in this interior not found on ordinary Camaro's!!! 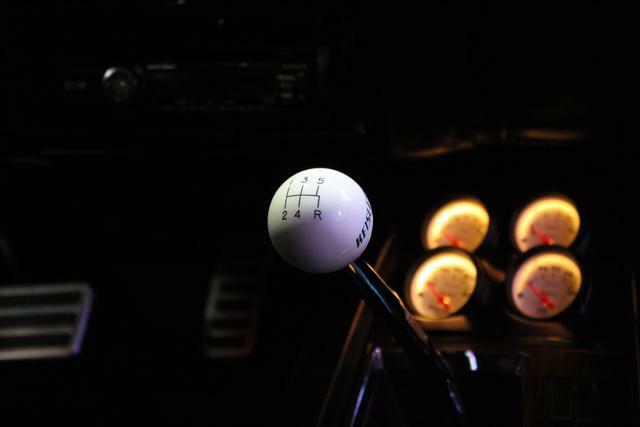 Correct 5-Speed Shifter Knob for the 5-Speed Tremec Transmission! Not only is the shifter knob correct, but so is the shifter bezel as well! 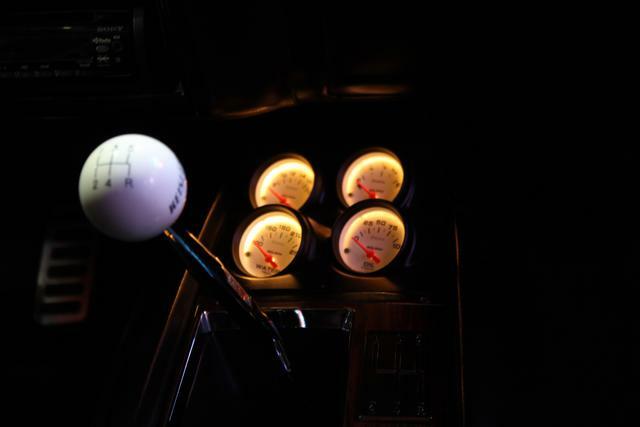 It features the Tremec 5-Speed Shift Pattern in the same location and design as the factory 3 or 4-Speed bezel! 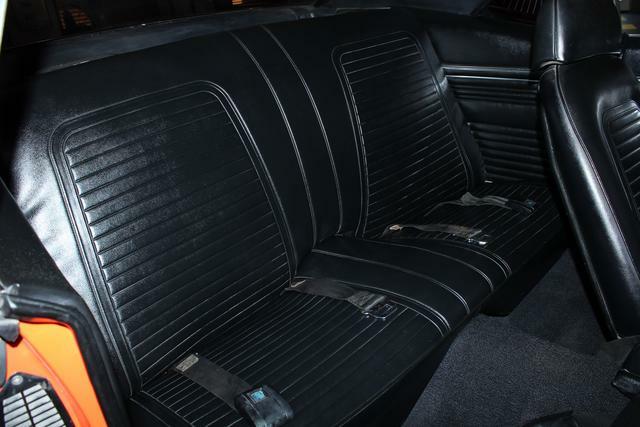 As previously mentioned, this car IS indeed equipped with a complete Vintage Air Heat and Air Conditioning Kit with ALL BRAND NEW Components that blows out ICE COLD A/C on those hot Summer days! It is electronically controlled to simplify the functionality and eliminate the problems the factory A/C systems run into. Custom AutoMeter Center Console Phantom Gauges! Fuel Level, Oil PSI, Water Temperature, and Voltage! 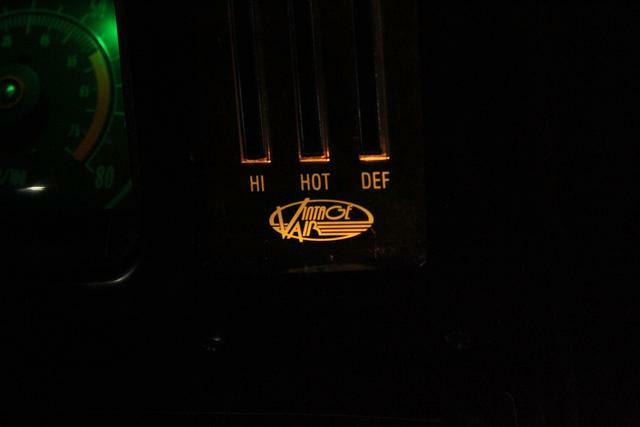 All backlit for easy reading on the nighttime cruises! Factory Style In-Dash 8000 RPM Tachometer that is fully working! 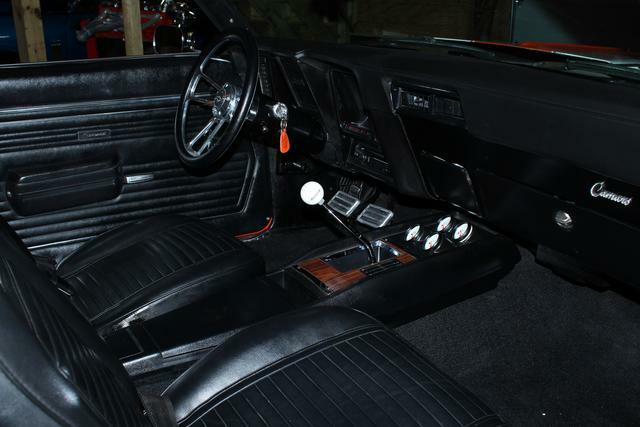 Most Camaro's out there have a Fuel Gauge in the dash and some cheap aftermarket Tachometer mounted on the steering column with an oversized hose clamp. This is just a quick, cheap, and tacky old-school method to have what should be in the dash!!! 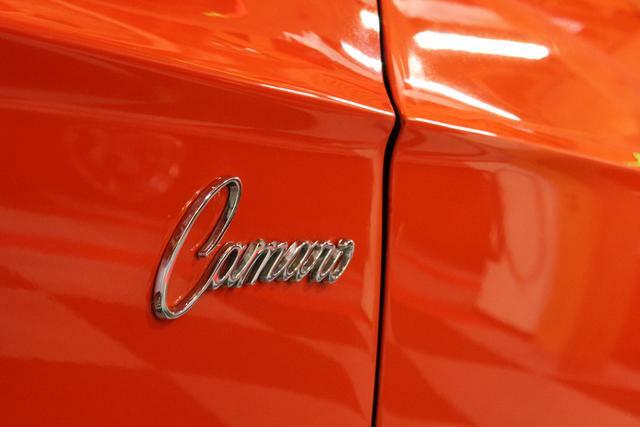 Attention to Detail here is what separates this car from most on the market! Fully Working Horn with Modern Loud 115db Low and High Pitched Wolo Brand Horns! Custom Integrated Electric Exhaust Cutout Switch Located to make a clean, subtle install! As previously mentioned, the windows on all four corners roll up and down smoothly with ease! These pedal pads are flat and a lot wider for your foot to have more surface area to make contact with. Brand New RestomodIt Brand New Custom Polished Billet Aluminum Cable-Driven Gas Pedal Assembly to match the other pedal pad covers! A lot more reliable and appealing than the factory rod-driven throttle linkage which utilizes bushings that degrade over time. That kind of linkage also has no adjustability for pedal height unlike a cable driven linkage! Headliner and Sunvisors appear to have been redone and are very smooth with no ripples! Brand New AMI Styling Ball Milled Polished Billet Aluminum Rear View Mirror! So much clearer than the factory mirror! Working Dome Light and Center Console Lights that we just upgraded with High Intensity LED Bulbs to give you more visibility inside your car when compared to the factory glass fuse-style bulbs that burn super hot, draw lots of current, yet still offer little visibility! Original Front Retractable GM Lap Belts Still Present and in Working Order!!! Even the Rear GM Lap Belts are still present!! 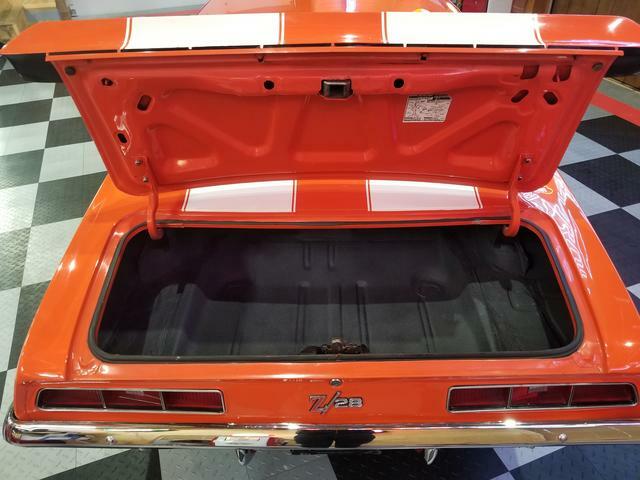 Trunk deck lid even has the factory jacking instructions decal! (See more photos below). 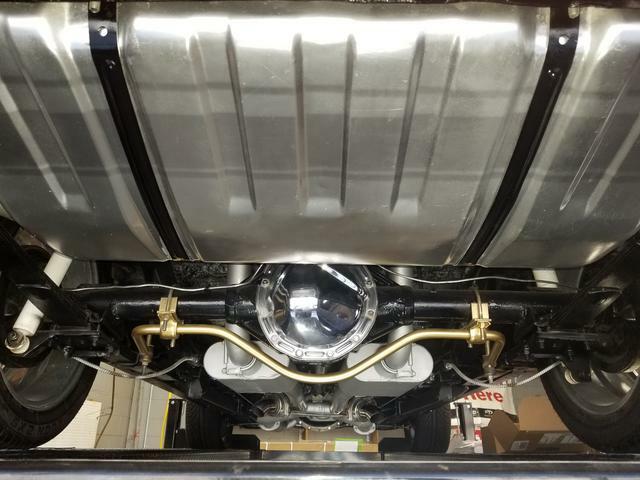 12 Bolt Posi/Limited Slip Rear End with a Chrome Differential Cover that lays both tires down to the ground just like an old school Big Block equipped muscle car should! Even has the official SFI Equipment Safety Tag! 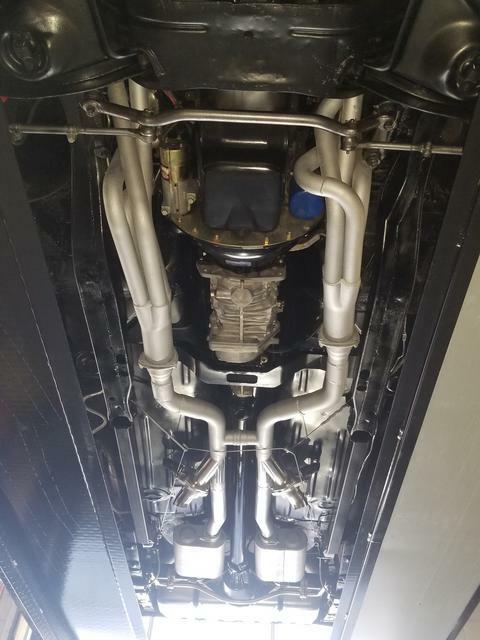 As previously mentioned, this car is equipped with a Custom Mandrel-Bent 2.5" Flowmaster Dual Exhaust System with an H-Pipe Crossover that scavenges exhaust a lot better than anything factory. Staggered Rear Shocks to prevent wheel hop! 3-Leaf Multi-Leaf Springs that has the perfect balance between comfort and firmness on the road! Not too bouncy yet not too hard like some suspensions where it feels as if you dropped into a sinkhole every bump you hit! Not some botched factory crossmember here! Upgraded Front Sway Bar keeps the suspension loaded and tires planted on hard cornering!